The Stage II is Fat Man's most popular Hub-to-Hub Kit! The Stage II uses standard, separate coil springs and shocks, and is also the basis for the conversion to basic Airride, their Stage IV. 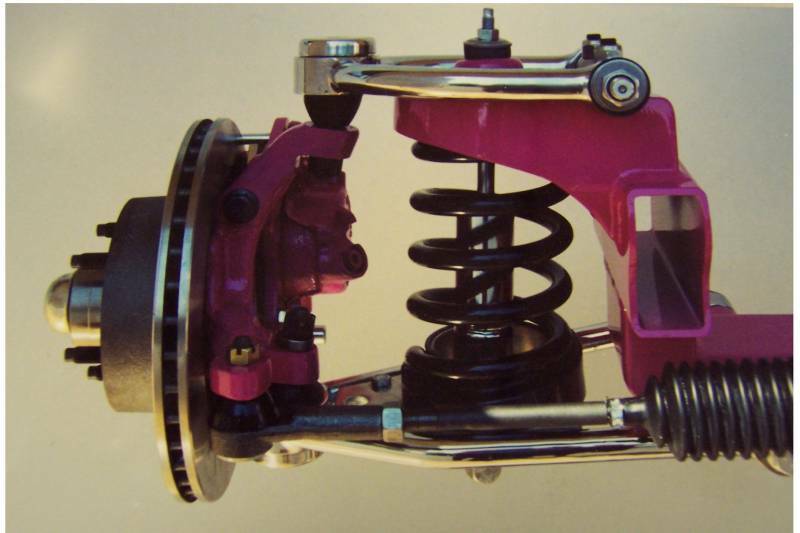 By adding a different lower arm with an exterior shock mount, a different lower arm plate, bolt-in upper spring mounts and a weld-on upper shock mount, Stage II can be converted to Stage IV. Included in the kit are manual rack & pinion, NEW spindles, springs, shocks, polished stainless control arms, and ECI upgraded iron disc brakes. 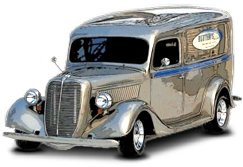 Options include: $100 for power rack ('79-'93), $70 for rack mainshaft extensions used on widened kits, and $175 for special manual rack and pinions for narrowed '35 to '40 Ford Kits. For power assist rack and pinions for narrowed '35 to '40 Ford Kits, add $325. The narrowed kits for '33 to '34 Ford are manual only at $175 extra. This is a nice kit! We have used many in our shop!